For this installment of Keeping Up With The Joneses, we’re looking at the various Girardin estates based in the Côte de Beaune. We’re going to give them the same treatment that we did exploring the Leflaive, Coche, Boillot, Gros and Morey family connections. A village-level Chassagne-Montrachet from Vincent Girardin. While some of these books are getting pricier as they fall out of print, several of them are still available used from Amazon for $8-40. They are well worth the investment for budding Burgundy geeks. One other book that I’ve been lusting to add to my collection is Jasper Morris’ Inside Burgundy. Morris recently did a fantastic interview with Levi Dalton where he noted that the 2nd edition of Inside Burgundy is on the horizon. I hope that the release of that new edition will mean used copies of the original become a little more affordable. From everything I’ve heard, this 656-page tome is an exceptional resource. But with that, let’s dive into the story of the Girardins. The Girardin family has been in Burgundy since at least 1570. However, their modern winemaking history dates to the 20th century. After World War II, Jean Girardin founded his eponymous estate in the village of Santenay. Not long after, Armand Girardin took over his family’s domaine in the northern part of the Côte de Beaune in Pommard. Unfortunately, I couldn’t determine the exact relationship between the two men. For the rest of this article, I will consider Jean the patriarch of the Santenay branch of Girardins and Armand the head of the Pommard branch. Jean would continue to grow his domaine with the acquisition of additional parcels, including Château de la Charrière. Following his retirement in 1981-1982, he divided his holdings among his four children with his three sons, Yves, Vincent and Jacques, each receiving 3 hectares and starting their own domaines. Vincent has been the most prominent member of the family, starting a negociant firm to go along with his estate vineyards. A stone cross marks the entrance of the Pommard premier cru vineyard Les Rugiens. Aleth Girardin’s great-grandfather planted vines here in 1906 that she still tends to today. Armand’s daughter Aleth began taking over her family’s estate in the late 1970s and then completely in 1995. I did find one noticeable discrepancy in my research on this domaine. Remington Norman and Charles Taylor’s profile of Aleth in The Great Domaines of Burgundy list her parents as Henri and Hélène Girardin. However, the vast majority of resources describe Aleth as the daughter of Armand, a former mayor of Pommard. Apart from websites copying Norman and Taylor’s blurb, the only reference I could find to a Domaine Henri Girardin is a 2001 newsletter with a tasting note for a 1990 Pommard Les Grands Epenots Premier Cru. I’m curious if Henri is perhaps another child of Armand and a sibling to Aleth? Or it could be an earlier ancestor with Aleth’s website noting that her family has been in Pommard for at least six generations. I found several references to her great-grandfather (but no name) planting some of the parcels in Rugiens back in 1906. Another mystery comes from Clive Coates’ The Wines of Burgundy. Here he lists Dominique and Anne-Marie Piguet-Girardin as growers in Auxey-Duresses with no other details. Their relationship to either branch of the Girardins has not been easy to determine. Allen Meadows of Burghound has tasting notes for a 1993 and 1999 Santenay Premier Cru La Comme made by Domaine Piguet-Girardin. It is possible that this could be related to the 4th child of Jean Girardin. However, I could not confirm that through my research. In 1988, Aleth married actor Michel Le Royer. When she took over her family’s domaine in the mid-1990s, she started bottling several of her wines as a Domaine Le Royer-Girardin. When they divorced some years later, Aleth changed the estate name to its current incarnation. After founding his estate in 1982 when he was just 18, Vincent Girardin moved his domaine to Meursault in 1994. That same year, he founded his negociant firm, Maison Vincent Girardin. The success of his negociant operation gave him the income to expand his vineyard holdings significantly with the purchase of many of Domaine Henri Clerc’s parcels. In 2010, Vincent and Véronique Girardin expanded into Beaujolais with their acquisition of La Tour du Bief in Chénas. Today, 80% of Girardin’s production is white wine with around 300,000 bottles produced from their Côte d’Or holdings and another 200,000 produced at their Beaujolais estate. Since 2007, Girardin has farmed his estate parcels biodynamically. A bottle of village-level Chassagne-Montrachet made by Yves Girardin bottled under the Château de la Charrière label. Yves has expand his domaine with vineyard holdings in Beaune, Chassagne-Montrachet and Pommard. Today he farms around 21.50 ha with his son, Benoît. Before joining the family domaine, Benoit spent some time working in Bordeaux as well as at other Burgundian estates. In 2003, Yves Girardin reacquired Château de la Charrière and produces wine under that label. In addition to his inherited parcels, Jacques and his wife Valérie have added holdings from Savigny-lès-Beaune, Chassagne-Montrachet and Pommard. 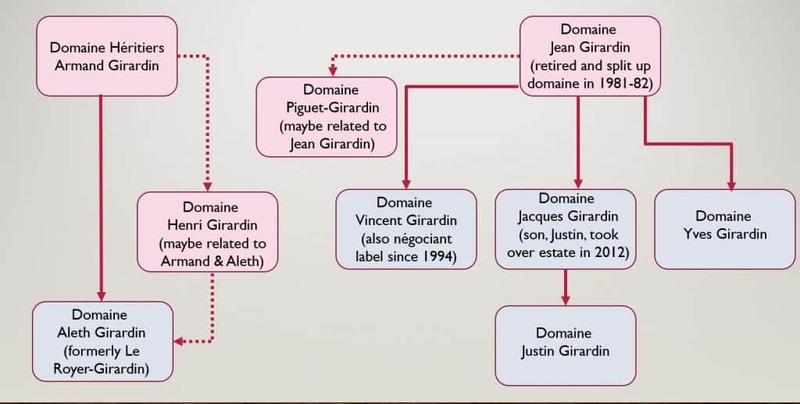 In 2012, management of the domaine passed on to their son, Justin. After taking over, he has been steadily converting the domaine to organic viticulture. Since 2015, Justin has been bottling more wine under his own name while still managing his father’s estate. Tagged Aleth Girardin, Allen Meadows, Armand Girardin, Auxey-Duresses, Bâtard-Montrachet, Beaune, Beauregard, Bienvenues-Bâtard-Montrachet, biodynamic, Burghound, Charles Taylor, Chassagne-Montrachet, Château de la Charrière, Chénas, Chevalier-Montrachet, Clive Coates, Clos des Mouches, Clos des Vignes Franches, Clos du Rousseau, Clos St. Jean, Côte de Beaune, Domaine Henri Clerc, Domaine Henri Girardin, Domaine Le Royer-Girardin, Domaine Piguet-Girardin, Girardin family, Inside Burgundy, Jacques Girardin, Jasper Morris, Jean Girardin, Justin Girardin, Keeping up with the Joneses in Burgundy, La Comme, La Tour du Bief, Les Epenots, Les Grands Epenots, Les Gravières, Les Peuillets, Les Rugiens, Levi Dalton, Maison Vincent Girardin, Maladière, Meursault, Michel Le Royer, Morgeot, Organic viticulture, Pommard, Remington Norman, Santenay, Savigny-lès-Beaune, The Great Domaines of Burgundy, The Wines of Burgundy, Vincent Girardin, Yves Girardin.